VISTA™ is a remarkable blend of iconic design and engineering excellence with an elegant white or a silver and white finish. Fitting within the ceiling grid, VISTA™ is stylish, low profile, and compact. Energy efficiency and comfort can be enhanced through the combined use of optional floor and presence sensors. It is also possible to close individual louvers via the wired remote control for personalized comfort. 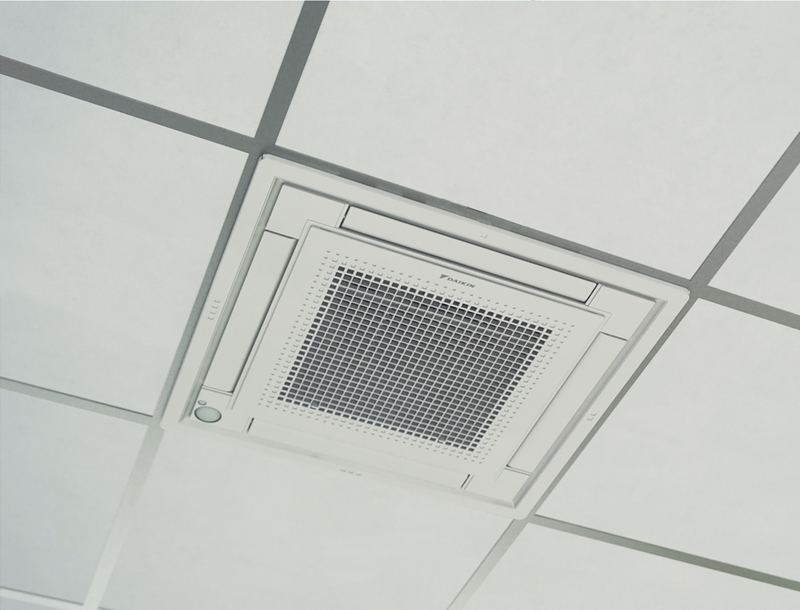 Extremely compact casing (2’x2’) enables unit to fit flush into ceilings without cutting ceiling tiles and without overlapping adjacent tiles. The VISTA™ decoration panel is available in white or silver & white. Capacities as low as 5,800 Btu/h makes the VISTA suitable for giving independent temperature control to small zones. Energy efficient operation thanks to specially developed small tube heat exchanger and optional intelligent sensors (BRYQ60A2W-white or BRYQ60A2S-silver). The use of a higher efficiency DC fan motor reduces operational power input up to 48% compared to the previous generation. Direct integration of fresh air through a factory knockout.